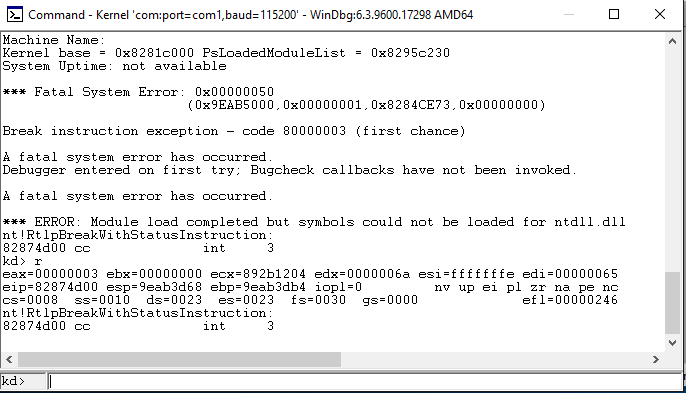 In the previous post we set up kernel debugging and had a brief play with WinDBG. In this part I'm going to work through setting up, communicating with and then hijacking the control flow of the 'HackSys Extremely Vulnerable Driver' that was created to go with a series of talks/workshops ran in India. In part 3 we will take this control and use to give ourselves a root shell. We start by getting the driver, compiling it and loading it in the debuggee VM we used last time. The source code can be obtained by git cloning https://github.com/hacksysteam/HackSysExtremeVulnerableDriver (or downloading the zip), you will need the Windows Driver Kit (to build the driver) installed, a driver loading tool (I used OSRLoader from: https://www.osronline.com/article.cfm?article=157 which admittedly looks sketchy as hell) and Visual Studio (to write and compile our exploit) installed on the machine. Once you have the source code and necessary tools, open a command prompt in the HackSysExtremeVulnerableDriver\Driver\Source directory and update the 'BuildHEVDVulnerable.bat' file so that the local symbol server path is set to 'set localSymbolServerPath=C:\symbols' (or wherever you set your symbol cache to be in the previous post) before executing the script. Now that the driver is installed and running we can start to interact with it and abuse it. As you can see the driver declares 11 different IOCTLs, in this post we will be focussing on the one defined as 'HACKSYS_EVD_IOCTL_STACK_OVERFLOW' this matches the standard definition format as 'HACKSYS_EVD' is the device name and 'STACK_OVERFLOW' is the function name. The arguments to the CTL_CODE macro are 'CTL_CODE(FILE_DEVICE_UNKNOWN, 0x800, METHOD_NEITHER, FILE_READ_DATA | FILE_WRITE_DATA)' where the first argument defines what kind of device the driver is for. This is stored in the DeviceType field of the DEVICE_OBJECT structure which is created when a driver is loaded, there is a long list of valid device types but as this device doesn't fit any of the existing types it is declared with the catch all type 'FILE_DEVICE_UNKNOWN'. The second/FunctionCode field is basically just an ID that can be referenced, in this case 0x800. Values under 0x800 are used by Microsoft and 0x800 or greater can be used by vendors, each function the driver supports has a different FunctionCode. The third/Method (sometimes reffered to as TransferType) field defines how a user process interacting with the driver will send and receive data from it, this field should be one of five different values. The first value is METHOD_BUFFERED in which input buffers are copied from user mode memory to kernel mode memory by the IO Manager (which is part of the kernel) before being used and output buffers do the reverse. The second and third potential values are METHOD_IN_DIRECT and METHOD_OUT_DIRECT (normally referred to together under the name 'Direct I/O') in this mode input, output or both (by ORing the constants, which is the fourth potential value) types of buffer are used when the driver needs to transfer large amounts of data, this normally involves using DMA (Direct Memory Access) or similar methods. The final possible value is the one that the HackSys driver is using: METHOD_NEITHER, as the name suggests this uses none of the previous methods and instead the driver has direct access to any input and output buffers in User Mode memory. Last of all the Access field defines what access type a process interacting with the driver must request, there are three constants which can be used to set this field. The first is FILE_ANY_ACCESS which means any process with a handle to the driver can interact with it, a handle is effectively an abstracted pointer, Windows makes heavy use of handles (the HANDLE type) in order to allow the kernel to change the types backing resources and adjust internal memory layouts while allowing the code interacting with them to stay unchanged. The second constant is FILE_READ_DATA which means the interacting process must have read permissions and the driver is allowed to transfer data from the device it interfaces with into system memory and finally FILE_WRITE_DATA where the interacting process must have write permissions and the driver is allowed to transfer data from system memory to the device it interfaces with. The HackSys driver ORs FILE_READ_DATA and FILE_WRITE_DATA together, to indicate that the process interacting with it must have both read and write permissions. The first argument hDevice is a HANDLE to the device driver we want to send requests to, this can be acquired using the CreateFile function as you can see in the code sample coming up. The second argument dwIoControlCode is one of the IOCTLs we saw defined earlier - in this case we are interested in 'HACKSYS_EVD_IOCTL_STACK_OVERFLOW'. The lpInBuffer and lpOutBuffer arguments (both or either of which can be NULL) are pointers to the I/O buffers and nInBufferSize and nOutBufferSize are their sizes. The lpBytesReturned argument is a pointer to a dword which will contain the number of bytes written into the output buffer after a request has been completed. Finally the lpOverlapped variable is optional and is a pointer to an OVERLAPPED structure which defines various details about using asynchronous IO, we won’t be using this so we’ll only see it set as NULL. When we call this function the I/O Manager will create an IRP (I/O Request Packet) which it delivers to the device driver, the IRP is just a structure which encapsulates the I/O Request and maintains its request status. The IRP is then passed down the Windows driver stack until a driver that can handle it is found. SIZE_T nInBufferSize = 1024 * sizeof(ULONG); //1024 is a randomly chosen size, a nice number that's probably big enough. Now that we understand what the driver does, how to communicate with it and how to crash it, we can start to put an exploit together. Now that we can get part of our buffers contents into the EIP register we want to set it to be a purposefully chosen value, which means we need to know what data in our buffer is actually overwriting its value on the stack. In order to do this we make use of the Metasploit Frameworks pattern_create utility which generates a string of unique patterns the length of the argument value. We can then find the offset of bytes in this string by passing them to the pattern_offset utility. We then compile and run the program again, again causing a crash which we can investigate in our debugging VM. We can see that there has been a crash again and when inspecting the data on the stack it is clearly a chunk of our patterned data, easily given away by the all the repeating bytes. We take the contents of the EIP register and pass it as an argument to the pattern_offset tool in Metasploit which will tell us where in our pattern the value occurred. As a sanity check we can also check the EBP value which should start 4 bytes immediately behind.